The GE P42DC is Amtrak's primary road diesel. Here #150 pulls the Cardinal into South Shore, Kentucky in 2006. Other than Acela Express power cars, the Siemens ACS-64 is Amtrak's only electric locomotive as of 2016, after they replaced older electric locomotives. Here, #606 pulls a train into New London Union Station. Amtrak operates both diesel and electric locomotives. Its electric locomotives are confined to the Northeast Corridor and the Philadelphia to Harrisburg Main Line, while its diesels may be found anywhere in the United States. GE Dash 8-32BWH 500–519 18 1991 Diesel Amtrak 501 & 502 sold to California Department of Transportation and were renumbered 2051 and 2052. GE P40DC 800–843 13 1993 Diesel Amtrak 15 units rebuilt to P42 specifications and are the only locomotives that remain in service. All others have been retired and are placed in storage, sold to other operators or scrapped. GE P42DC 1–207 186 1996 Diesel Amtrak Amtrak’s main road diesel. Various units are out of service due to incidents. Siemens Sprinter ACS-64 600–665, 667–670 67 2014 Electric Amtrak 601 and 627 are heavily damaged after being in separate accidents and are currently out of service. Siemens Charger SC-44 1400–1407 8 2016 Diesel WSDOT 1 WS DOT unit was wrecked in the Cascades derailment in 2017. Unit will be sent back to Siemens for repair. EMD MP15 530–539 10 1993 Diesel Ex-P&LE. EMD GP38-3 720–724 5 1994 Diesel Ex-CS/CSX/P&LE. EMD SW1000R 790–799 4 1994 Diesel Ex-B&O/MKT/P&LE/SOO. EMD SW1500 540, 541 2 2001 Diesel Ex-CSX. Acquired in exchange for 2 EMD F40PH engines. EMD SW1001 569 1 2001 Diesel Ex-CSX. Acquired in exchange for 2 EMD F40PH engines. In August 2013, the Illinois DOT, in conjunction with Amtrak and other state DOTs, released a joint procurement RFP for 32 high-speed (125 mph), diesel-electric engines for use on intercity corridor and commuter routes. Siemens won the bid with the new Charger engine. Of the 32 base engines, 21 would be allocated for Illinois and Michigan service, 6 would be for Amtrak California service and the remaining 5 being used on the Cascades service in Washington. The contract includes options for up to 75 additional engines for use on intercity corridor and commuter routes, and up to 150 engines for use on long distance routes for a total of 257 engines. The long distance engines would differ mainly in the following ways: larger fuel tank (2,200 gallons vs. 1,800 gallons) and higher HEP capacity (1000 kW vs. 800 kW). Caltrans exercised an option to purchase an additional 14 of the Charger locomotives for use in California in addition to the initial 6 orders for use on the Pacific Surfliner. In June 2018, Amtrak announced they are moving to either acquire new locomotives or rebuild its current diesel fleet of locomotives to supplement and replace its aging National Network diesel locomotive fleet used on Long Distance and some State Supported routes. On December 21, 2018, Amtrak ordered an additional 75 Chargers to replace older Genesis locomotives on long-distance services. The first of these locomotives will enter service in 2021, with the order completed in 2024. An Acela Express at Old Saybrook, Connecticut in 2011. Bombardier/Alstom Acela Express 2000–2039 40 1999 Power cars; each one is semi-permanently coupled to each end of a trainset. Bombardier/Alstom Acela Express 3200–3559 120 1999 Unpowered trailer cars; six (four business class, one first class and one cafe) per trainset. Talgo Series VI 7100–7905 52 1998 4 trainsets used on Amtrak Cascades. Unpowered; 13 cars per trainset. 2 of the trainsets (Mt. Hood and Mt. Olympus) are owned by Amtrak, and the other 2 (Mt. Baker and Mt. Rainier) are owned by the Washington State Department of Transportation. Another trainset (Mt. Adams) was destroyed in the 2017 Washington train derailment. Talgo Series 8 7110–7911 26 2013 2 trainsets used on Amtrak Cascades. Unpowered; 13 cars per trainset. The 2 trainsets (Mt. Bachelor and Mt. Jefferson) are owned by the Oregon Department of Transportation. On January 17, 2013, Amtrak announced that it has entered collaboration with the California High-Speed Rail Authority to draft up specifications for the standard high speed train set to be used along the Northeast Corridor and replace the original Acela train sets. The joint order was planned to be for 62 trainsets, with 32 earmarked for the NEC, and having a capacity between 400-600 people. In June 2014, plans for the joint order were abandoned; according to Amtrak, the two companies' requirements were too different to make a joint order economically and operationally feasible. In September 2015, Amtrak selected Alstom as the builder of 28 Acela replacement trainsets and entered into exclusive negotiations with the company, expected to yield a firm contract worth roughly $2.5 billion by the end of the year. In August 2016, Amtrak approved the contract with Alstom to make 28 new Avelia Liberty train sets to replace the Acela on the Northeast Corridor with delivery by 2021. The new sets will be capable of running at speeds of up to 186 mph but will initially be limited to 160 mph. Amtrak will be upgrading tracks along the corridor to allow these sets to run at that speed. The new trainsets will have more passenger seating and improved interior amenities as compared to the current Acela equipment. Two additional Talgo 8 trainsets were bought for use in Wisconsin but never operated. After the 2017 Washington train derailment, Amtrak sought to lease the trainsets for the Cascades. A Superliner lounge on the Auto Train. Amfleet II coaches on the Silver Star. The Pacific Parlour Car "Sonoma Valley," one of the last remaining Hi-Level cars on the roster. The Ocean View, Amtrak's last true dome car, on the Cardinal in 2011. Most Amtrak F40PHs received the Phase V color scheme and baggage doors upon conversion to NPCUs. Budd Company Metroliner Cab Control Car 9632–9651 15 1969 Former Metroliner electric multiple unit coaches converted to be used as cab control coaches for push-pull operation. Budd Company Metroliner First Class Conference Car 9800 1 1969 #9800 Metroliner, a former Metroliner electric multiple unit cafe converted to be used as a first class conference car. It is primarily used as a business car and on charter services on the Northeast Corridor. Budd Company Amfleet I 43346–48196, 81500–82999 461 1975 Coach, Business, Cafe, and split Business/Cafe configurations. Pullman-Standard Superliner I 31000–38034 243 1979 Bi-level cars. Coach, Coach/Baggage, Sleeper, Diner and Lounge/Cafe configurations. Budd Company Amfleet II 25000–28024 139 1982 Coach and Dinette configurations. Bombardier Horizon 53501–58108 92 1988 Coach, Cafe, and split Business/Cafe configurations. Bombardier Superliner II 32070–39046 185 1993 Bi-level cars. Coach, Sleeper, Deluxe Sleeper, Diner, Lounge/Cafe, and Transition Sleeper configurations. Morrison-Knudsen Viewliner I 62000–62049 48 1995 Single-level cars, all configured as sleepers. EMD Non-Powered Control Unit 90200–90413 19 1996 Former F40PH locomotives converted into Non-Powered Control Units. Alstom Surfliner 6300–6908 39 2000 Bi-level cars. Amtrak California Pacific Surfliner Coaches. FreightCar America Auto Train Autorack 9200–9279 80 2005 Used on the Auto Train only. CAF Viewliner II 61000–69009 83 (130) 2015 Cars will be configured as 25 sleepers, 25 diners, 10 baggage/dormitory and 70 baggage cars. Budd Company Dome Lounge 10031 1 1955 #10031 Ocean View, a Great Dome dome car originally from the Great Northern Empire Builder. The car can mostly be seen on special trains and periodically on scenic Amtrak routes, such as the Downeaster and Pacific Surfliner. Morrison-Knudsen California Car 8001–8814 66 1996 Bi-level cars. Amtrak California coaches. Owned by the California Department of Transportation. Alstom Surfliner 6351–6965 22 2002 Bi-level cars. Amtrak California coaches. Owned by the California Department of Transportation. St. Louis Car Co. / Morrison-Knudsen Comet IB 5001–5014 14 1968 Amtrak California coaches, used on the San Joaquin route. Ex-NJ Transit coaches, rebuilt 2011–2013. Owned by the California Department of Transportation. Painted in Amtrak California/Caltrain heritage paint scheme. St. Louis Car Co. / Pullman-Standard North Carolina Fleet 400001–400205 20 1952–1965 Various rebuilt coaches and baggage/lounge/bike/vending cars used on the Piedmont route. Owned by the North Carolina Department of Transportation. EMD Non-Powered Control Unit 90252–90340 3 1996 Former F40PH locomotives converted into Non-Powered Control Units. Used as cab control car on the Amtrak Cascades route and do not have a roll-up door for loading baggage. Owned by the Oregon Department of Transportation. EMD Non-Powered Control Unit 101–105 5 2019 Former F59PH locomotives converted into Non-Powered Control Units. Used as cab control car on the Piedmont route and do not have a roll-up door for loading baggage. Owned by the North Carolina Department of Transportation. Three of Amtrak's business cars on the back of the Blue Water in 2011: the Pacific Cape, Ocean View, and Beech Grove. 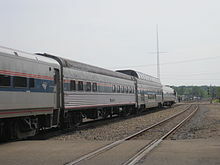 #10001 Beech Grove, an "Amfleet office car" used for official business by the Amtrak president and other VIPs. This unique car has an open observation platform, lounge seating area, dining room, kitchen and 2 sleeping accommodations. it also has lights, GPS equipment and a camera to inspect tracks for defects. It is named for Amtrak's Beech Grove Shops where the car was converted from an Amfleet I coach in 1984. #10002 Corridor Clipper, a Amfleet I-based track geometry car. It is periodically attached to the end of a diesel or electric revenue-running train or is hauled by a locomotive only. The car has a special pantograph that is used to test and measure overhead lines. #10003, an unnamed Acela-based track geometry car. It is periodically inserted into an Acela Express consist between a power car (locomotive) and the nearest end car, resulting in a train with two power cars and seven intermediate cars rather than the normal six. #10004 American View, a Viewliner-based "inspection car" with rear-facing seats and large glass window at the end of the car that allows passengers to observe the tracks. The car can also be used by maintenance crews to visually inspect the tracks for defects and by the Amtrak president and other executives for official purposes. Originally numbered #2301, the American View is one of the three prototype Viewliner cars and was the last passenger railcar produced by Budd. 10005, an unnamed catenary measurement car. Like car #10002 Corridor Clipper, this car has a special pantograph that is used to test and measure overhead lines. 10020 Pacific Bend, a heritage Pacific-series 10-6 sleeper formally used by Union Pacific, now converted for crew use on special trains. Four roomettes remain for staff use, five roomettes have been converted to storage areas and one has been converted into a shower. The bedrooms have been removed and replaced with a crew lounge. 10021 Pacific Cape, a heritage Pacific-series 10-6 sleeper now converted for crew use on special trains. It is usually used along with the Beech Grove for official business by the Amtrak president and other VIPs. #9800 Metroliner, a former Metroliner electric multiple unit cafe converted to be used as a first class conference car. Primarily used on charter services on the Northeast Corridor. The car is broken up into 3 areas, one end of the car has 12 business class seats in a 2+1 configuration, the middle has a cafe, and the other end has conference areas (a large private conference room with 8 seats around a large table, 2 medium-sized semi-private conference sections with 4 seats around a table and 2 small semi-private conference sections with 2 seats around a table). The car at one time had cab controls that have since been removed. In July 2010, Amtrak announced an order for 130 single level Viewliner rail cars from CAF USA, with deliveries planned to begin in October 2012. The contract, valued at $298.1 million, was for 55 baggage cars, 25 split baggage/crew dormitory cars, 25 dining cars, and 25 sleeper car. In mid-2014, Amtrak changed 15 of the baggage/dormitory cars to baggage cars. After extensive delays, all 70 baggage cars were delivered by late 2016, with the first diner delivered in November. As of January 2017, the full diner order was slated for delivery by the middle of the year, with the baggage/dormitory and sleeper cars following. In November 2012, a joint venture led by Sumitomo Corporation and Nippon Sharyo was awarded a contract by the California Department of Transportation (Caltrans) to build 130 bi-level passengers cars for Midwestern and California service. Under the terms of the contract, which used federal funding, Caltrans would own 42 of the cars for Amtrak California service, while a consortium of Illinois, Michigan, and Missouri would own the remaining 88 for Amtrak service out of Chicago. In August 2014, the states ordered 45 more cars—34 for Midwest service and 11 for California. In mid-2015, a prototype carbody failed a compression test, leading to an indeterminate delay in delivery. As of January 2017, no progress had been made on building the cars, and Caltrans, Illinois, Nippon Sharyo, and the Federal Railroad Administration were in negotiations to extend the September 30, 2017 deadline for spending the federal funding used in the order. Amtrak and Sumitomo would announce later that year of their amended order of 137 single-level passenger cars to be built by Siemens at their Sacramento plant, with Sumitomo dropping Nippon-Sharyo as the builder. Delivery is slated for 2020–2021, with construction expected to begin within 2018. Although not part of its fleet, private railroad cars may also be hauled by Amtrak trains if suitably certified and equipped with head end power (HEP). 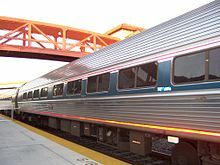 Groups such as the American Association for Private Rail Car Owners, Inc., (AAPRCO) represent the interests of car owners in dealing with Amtrak. These private cars may be used by their owners or chartered by individuals for private travel behind scheduled Amtrak trains. All non-Amtrak cars, including those of the Department of Transportation, receive car numbers in the 800000 series for tracking purposes. In the early years of Amtrak's existence, it required that private cars be marked in the "Pointless Arrow" scheme as the neophyte company worked to stamp out "rainbow" trains with a system paint scheme, but this policy was abandoned as Amtrak matured, allowing car operators to use personalized or heritage schemes. This is a partial listing of locomotives and rolling stock formerly operated by Amtrak. This does not include equipment inherited from private railroads. EMD F40PHR #315 leads the California Zephyr out of Tunnel #17 near Newcastle, California in 1995. EMD SDP40F #629 with the San Francisco Zephyr in 1978. GE E60 #604 at 30th Street Station in 1997. EMD SDP40F 500–649 1973–1987 Diesel Amtrak's first diesel locomotive purchase. Engines were plagued with derailment problems. Most were traded back to EMD and their components used to build F40PHR locomotives. 18 engines were given to Santa Fe in exchange for CF7 switchers. 644 has been preserved and is currently being restored in Boulder City, NV along with F40PHR 231. GE P30CH 700–724 1975–1991 Diesel Amtrak's first diesel locomotive purchased with an onboard HEP generator, nicknamed "Pooch". Units plagued mechanical problems. All have been retired in late 1991 and scrapped by late 1992. EMD F40PH 200–229, 410–415 1976–2003 Diesel After retirement many engines were converted to NPCUs. EMD F40PHR 230–409 1977–2003 Diesel Built with components from retired SDP40F locomotives. After retirement, many engines were converted to NPCUs. Engines 231, 281 and 307 have been preserved. Engine 406 is used on Amtrak's 40th Anniversary Exhibit Train since 2011. Engines 401–405 and 407–409 remain on roster, stored. EMD/Siemens F69PHAC 450–451 1989–1993 Diesel Built for the United States Department of Transportation to test AC locomotive technology. They were loaned to Amtrak and were later returned to EMD. GE E60 950–975 1974–2003 Electric Units plagued by derailment problems at high speed. Many were sold off, though some remained in use until 2003. 603 (Originally numbered 964) and 958 have been preserved. Bombardier/Alstom HHP-8 650–664 1999–2014 Electric Suffered from low reliability problems. All locomotives stored; replaced by the Siemens ACS-64. Last ran on November 7, 2014. Just before retirement, units were renumbered 680–694 to accommodate numbering of ACS-64 units. ALCO S-2 746 Diesel Ex-US Army. EMD SW1 730–736, 738–745 1976 Diesel Built 1947–1950 for the New York Central Railroad. 737 remains in service. ATSF CF7 575–599 1984–2003 Diesel Ex-ATSF. Acquired in exchange for 18 EMD SDP40F units. EMD GP40 650–664 1991–1993 Diesel Leased and later returned. EMD SSB1200 550–567 1984–2008 Diesel Ex-ATSF. Acquired in exchange for 18 EMD SDP40F units. GE 45t 7 Diesel Ex-US Army. Beech Grove Shops switcher. GE 65t 5, 6 Diesel Ex-US Army. Beech Grove Shops switchers. Railpower GG20B 599 2006–2008 Diesel Leased and later returned. An RTL Turboliner crosses the Seneca River near Savannah, New York in 1984. ANF Turboliner 58–69 1973–1995 Gas turbine Semi-permanently coupled trainset. Rohr Turboliner 150–163 1976–2002 Gas turbine Semi-permanently coupled trainset. 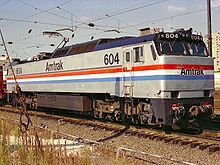 (power cars) 1980–1982 Diesel Amtrak leased two trainsets but declined an option to buy them and they were later returned to Bombardier. Budd Company / American Car and Foundry Baggage cars 1159–1857 6 1950–1961 All scheduled to be retired by 2017 and replaced by the 70 Viewliner II baggage cars and 10 baggage/dormitory cars. Budd Company Dining cars 8505–8553 11 1948–2017 All scheduled to be retired by 2017 and replaced by the 25 Viewliner II dining cars. Budd Company Parlor Car 39970–39975 5 1956–2018 Pacific Parlor Cars used on Amtrak's Coast Starlight. Originally Hi-Level Sky Lounge cars, built for the Santa Fe's El Capitan service. EMD E9 "A" and "B" units with the San Joaquin in 1974. EMD FP7 leading the San Francisco Zephyr in 1975. PRR GG1 with the Southern Crescent in 1976. 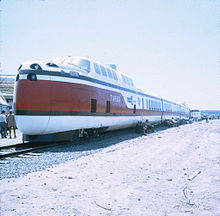 UAC TurboTrain at Transpo '72. Amtrak inherited numerous locomotives from private railroads on its formation in 1971. Most of these were retired by the end of the decade, if not earlier. These locomotives are enumerated below, with their original owners. EMD FL9 231–242 New Haven Railroad, via Penn Central and Conrail 1971-(At least 1996) Dual-mode. UAC TurboTrain 50–53 United States Department of Transportation 1971-1976 Gas turbine trainset. Previously operated by New Haven Railroad and Penn Central. Budd Metroliner 800–830, 850–869, 880–889 Penn Central Electric multiple unit. 860 has been preserved. Many remain active as de-motored cab cars. Some units still remain stored in Bear, DE shops as of 2015. ^ a b Amtrak (March 29, 2012). "Amtrak Fleet Strategy" (PDF). Retrieved 2012-02-11. ^ a b c d e f g h i j k l m n o "Motive Power Roster". On Track On Line. November 1, 2018. Retrieved November 6, 2018. ^ a b c Sutton, David Warner and Harry. "On Track On Line - Amtrak Motive Power Roster". on-track-on-line.com. Retrieved 2018-09-28. ^ "404". Archived from the original on 2014-07-14. Retrieved 2014-07-02. ^ "404". Archived from the original on 2013-10-02. Retrieved 2013-08-12. ^ "Cleaner Train Engines Coming to the Central Coast". 2015-11-10. ^ "Amtrak to Improve National Network with New Locomotives" (Press release). Amtrak. December 21, 2018. ^ "Amtrak and California abandon joint rolling stock procurement". Railway Gazette. 23 June 2014. Retrieved 23 September 2015. ^ "Amtrak selects Alstom for Northeast Corridor train contract". Railway Gazette. 23 September 2015. Retrieved 23 September 2015. ^ "Amtrak orders Alstom trains for Northeast Corridor". International Railway Journal. August 26, 2016. ^ "The Next generation of Amtrak High Speed trains". Amtrak. 26 August 2016. Retrieved 26 August 2016. ^ Federal Railroad Administration (February 1, 2018). "Petition for Waiver of Compliance" (PDF). Federal Register. 83 (22): 4728. ^ Egebrecht, Mark (December 30, 2011). "The "Cabbage,"Amtrak's Recycled F40". Railroad.net. Retrieved September 26, 2013. ^ a b c "AMTRAK PREVIEWS NEW LONG DISTANCE CARS" (PDF). Amtrak. Archived from the original (PDF) on 29 October 2013. Retrieved 24 October 2013. ^ Warner, David; Simon, Elbert (2011). Amtrak by the Numbers: A Comprehensive Passenger Car and Motive Power Roster, 1971-2011. White River Productions. ISBN 978-1932804126. ^ Warner, David (November 1, 2018). "On Track On Line - Amtrak Passenger Equipment Roster - Rolling Stock". on-track-on-line.com. Retrieved December 18, 2018. ^ "AMTK 10001". Archived from the original on 18 February 2015. Retrieved 11 April 2014. ^ "AMTK10003: Acela Inspection Car". Archived from the original on December 4, 2002. Retrieved September 10, 2010. ^ "American View (AMTK 10004)". Retrieved 11 April 2014. ^ "Search Results – 9800". Railpictures.net. Retrieved 11 April 2014. ^ "Amtrak buying 130 new rail cars". Washington Post. July 23, 2010. Retrieved 2012-08-10. ^ "Rail News - Amtrak awards $298.1 million contract to CAF USA for 130 rail cars". Progressiverailroading.com. 2010-07-26. Retrieved 2012-08-10. ^ a b "Trains News Wire EXCLUSIVE: States add to bilevel order, Amtrak opts for more baggage cars". Trains Magazine. August 11, 2014. Retrieved January 27, 2017. ^ "First Viewliner II diner on the move". Trains Magazine. November 23, 2016. Retrieved January 27, 2017. ^ "Hotline #997: Southern Republicans favor Gulf Coast Train Line; Big Boost for Los Angeles Rail Transit; Ski Train Back in Action; NARP Updated On New Single-Level Amtrak Cars; Members Offer Input To FRA Southeastern Rail Study". National Association of Railroad Passengers. January 6, 2017. Retrieved January 27, 2017. ^ a b "Illinois Gov. Quinn announces $352 million rail-car contract for high-speed lines". Progressive Railroading. November 20, 2012. Retrieved January 27, 2017. ^ "Nippon Sharyo prototype fails test, workers laid off". Trains Magazine. September 2015. Retrieved January 27, 2017. ^ "UPDATE: Nippon Sharyo lays off 100 more workers in Illinois". Trains Magazine. January 23, 2017. Retrieved January 27, 2017. ^ "Guidelines for Private Cars on Amtrak" (PDF). www.amtrak.com. June 21, 2018. Retrieved December 18, 2018. ^ "All-Time Amtrak Diesel Locomotive Roster as of 8-29-90". August 29, 1990. Retrieved 2011-11-19. Simon, Elbert; Warner, David C. (2011). Amtrak by the numbers: a comprehensive passenger car and motive power roster, 1971-2011. Kansas City, Missouri: White River Productions. ISBN 978-1-932804-12-6. Soloman, Brian (2017). North American Locomotives (1st ed.). Crestline Books. ISBN 978-0-7858-3533-2. 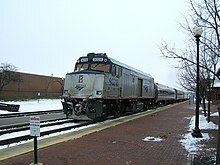 Wikimedia Commons has media related to Rail vehicles of Amtrak.